Although most analysts use some combination of fundamental analysis and technical analysis to make their securities recommendations, for Securities Industry Essentials (SIE) exam purposes, you need to be able to differentiate between the two types. To help lead people down the path of riches, you have to analyze your customer’s portfolio and the market and try to find a good fit. In many cases firms hire analysts to provide registered reps with investment information, which helps you determine the best recommendations for each customer. Fundamental analysts perform an in-depth analysis of companies. They look at the management of a company and its financial condition (balance sheets, income statements, the industry, management, earnings, and so on) and compare it to other companies in the same industry. They can also compare many years of financial statements to help determine whether a company is heading in the right direction. In addition, fundamental analysts even look at the overall economy and industry conditions to determine whether an investment is good to buy. In simplest terms, fundamental analysts decide what to buy. A fundamental analyst’s goal is to determine the value of a particular security and decide whether it’s underpriced or overpriced. If the security is underpriced, a fundamental analyst recommends buying the security; if the security is overpriced, he recommends selling or selling the security short. The following discussion explains some of the fundamental analyst’s tools of the trade and how to use them. The balance sheet provides an image of a company’s financial position at a given point in time. The SIE exam tests your ability to understand the components and how financial moves that the company makes (buying equipment, issuing stock, issuing bonds, paying off bonds, and so on) affect the balance sheet. In general, understanding how a balance sheet works is more important than being able to name all the components. 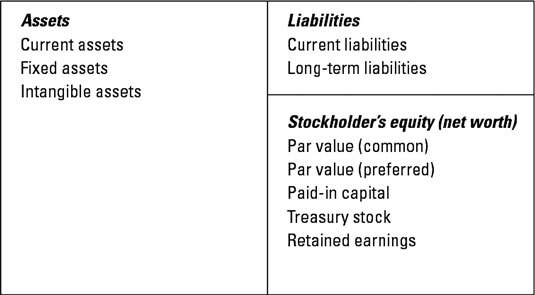 Components of a balance sheet. People call this statement a balance sheet because the assets must always balance out the liabilities plus the stockholders’ equity. Current assets: Owned items that are easily converted into cash within the next 12 months; included in current assets are cash, securities, accounts receivable, inventory, and any prepaid expenses (like rent or advertising). Note: Fundamental analysts also look at methods of inventory valuation, such as LIFO (last in first out) or FIFO (first in first out). In addition, they look at the methods of depreciation, which are either straight line (depreciating an equal amount each year) or accelerated (depreciating more in earlier years and less in later years). Fixed assets: Owned items that aren’t easily converted into cash; included are property, plant(s), and equipment. Because fixed assets wear down over time, they can be depreciated. Intangible assets: Owned items that don’t have any physical properties; included are items such as trademarks, patents, formulas, goodwill (a value based on the reputation of a company — for example, the name McDonald’s is probably worth more than Fred’s Sloppy Burgers), and so on. Current liabilities: Debt obligations that are due to be paid within the next 12 months; included in current liabilities are accounts payable (what a company owes in bills), wages, debt securities due to mature, notes payable (the balance due on money borrowed), declared cash dividends, and taxes. Long-term liabilities: Debt obligation due to be paid after 12 months; included in long-term liabilities are mortgages and outstanding corporate bonds. Par value of the common stock: The arbitrary amount that the company uses for bookkeeping purposes. If a company issues 1 million shares of common stock with a par value of $1, the par value on the stockholders’ equity portion of the balance sheet is $1 million. Par value of the preferred stock: The value that the company uses for bookkeeping purposes (usually $100 per share). If the company issues 10,000 shares of preferred stock, the par value on the stockholders’ equity portion of the balance sheet is $1 million. Paid in capital: The amount over par value that the company receives for issuing stock. For example, if the par value of the common stock is $1 but the company receives $7 per share, the paid in capital is $6 per share. The same theory holds true for the preferred stock. Treasury stock: Stock that was outstanding in the market but was repurchased by the company. Retained earnings: The percentage of net earnings the company holds after paying out dividends (if any) to its shareholders. An income statement tells you how profitable a company is right now. Income statements list a corporation’s expenses and revenues for a specific period of time (quarterly, year-to-date, or yearly). When comparing revenues to expenses, you should be able to see the efficiency of the company and how profitable it is. You don’t need to actually see a detailed balance sheet from a company, but knowing the components of an income statement is important. Take a look at the following figure to see how an income statement is laid out. Most of the items are self-explanatory. Components of an income statement.